Kokekokko is the best yakitori place in Los Angeles, and I’ve been to most. Here it’s all about the food. The first thing out were quail eggs, plump, slightly larger than usual, lightly charred. The “meatballs” (tsukune) were juicy and grilled to perfection. The moist tebasaki (wing) meat fell off the bones. “Toku-hatsu”, a fattier variety of hatsu (chicken heart), was a real revelation. 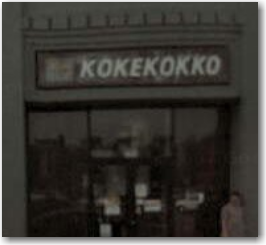 Kokekokko is in Little Tokyo downtown. You’ll often find yourself waiting for a table, or waiting for your food once you’ve ordered. That’s OK. Wash down your sticks with some sake from their reasonably good list. This entry was posted on Wednesday, May 30th, 2007 at 10:32	and is filed under eating. You can follow any responses to this entry through the RSS 2.0 feed. You can skip to the end and leave a response. Pinging is currently not allowed.